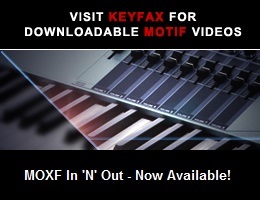 Viewing topic "Muting Keys generally"
this may sound a little weird but is it possible to mute keys on the MOXF generally to use them as control keys for a MIDI setup? Sorry - my English isn’t that good ... I don’t think of all keys (I use local off sometimes) but of some (!) keys, lets say - as an example - C0-e0. ... I don’t think of all keys (I use local off sometimes) but of some (!) keys, lets say - as an example - C0-e0. In general, setting the high Note Limit lower than the low Note Limit creates a number of “muted” keys. Easily applied to a Part in Performance, Song, or Pattern mode. For your example, set Note Limit to F0 - B-1. Keys B-1 and below will sound, as will F0 and above. C0-E0 won’t. Thank you for your advice - that helps in most cases but isn’t there a workaround to fix this muting as a default for all situations as long as it is wanted and independent from mode and status? - that helps in most cases but isn’t there a workaround to fix this muting as a default for all situations as long as it is wanted and independent from mode and status? 1) Turn off Local Control. 2) Connect the XF’s MIDI-Out to the input of a MIDI Thru/Splitter (such as http://www.midisolutions.com/prodthr.htm). Both of the Thru’s outputs will duplicate the XF’s MIDI-Out. 3) Connect one of the Thru’s outputs to the device you want to control. That device will receive Note-on/off from any XF key. 4) Connect the other of the Thru’s outputs to the input of a MIDI Event Processor (such as http://www.midisolutions.com/prodevp.htm) which has been programmed to filter out the desired note range. 5) Connect the output of the Event Processor to the XF’s MIDI-In. All keys except those filtered by the Event Processor will sound.